Bohemian Rhapsody will rock you — or at least Rami Malek's performance in the film will. Studio 20th Century Fox screened Bohemian Rhapsody, the musical drama biopic centered on the legendary rock band Queen and its even more iconic frontman Freddie Mercury, for press and critics on Sunday, October 7 in Los Angeles. Those in attendance have since shared online their first reactions to the film. The verdict? Bohemian Rhapsody is largely enjoyable, if not pretty cookie-cutter as far as biopics of its kind go. 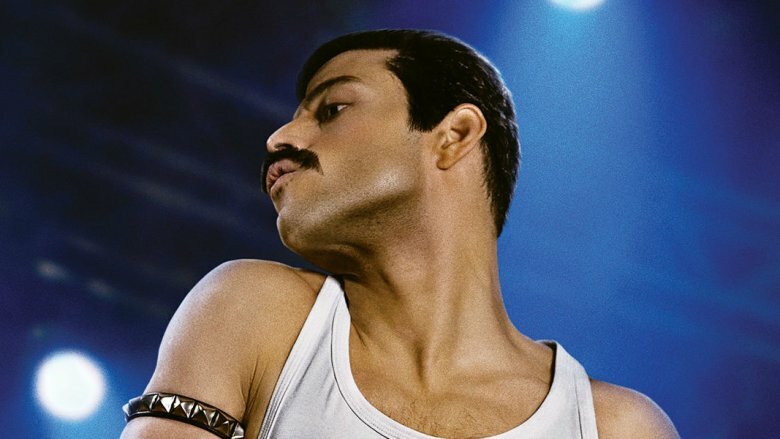 And while IndieWire's Anne Thompson expects the film to "get mixed reviews," it appears everyone agrees that Malek's turn as Freddie Mercury is a dazzling sight to behold. Many — even Kyle Buchanan of The New York Times, who called Bohemian Rhapsody a "glorified Wikipedia entry" — have praised Malek's performance as being out-of-this-world incredible, so much so that plenty are already placing bets on Malek receiving an Oscar nomination for Best Actor for his work. Us Weekly film critic Mara Reinstein wrote that while Bohemian Rhapsody may be so-so, Malek's Mercury is anything but. "How do you turn an OK movie into a good one?" she tweeted. "Five words: Rami Malek as Freddie Mercury. #BohemianRhapsody." Awards Daily's Jazz Tangcay was shocked by how wonderful Bohemian Rhapsody truly is, and, like virtually everyone else, was impressed by Malek's leading turn. "Bloody Hell! Absolutely did not expect @BoRhapMovie to be a thousand degrees of fantastic," tweeted Tangcay. "Rami Malek has a kind of magic and one vision of a champion performance. Prepare to be rocked!!! #BohemianRhapsody." Jenna Busch, the founder and editor in chief of Legion of Leia, was also completely swept away by the film, especially Malek's performance. "Absolutely beyond blown away by #BohemianRhapsody! Rami Malek is phenomenal," she shared. "Gorgeous story, amazing concert movie… I don't have enough words!" More unabashed praise came from film critic Scott Mantz, who wrote on Twitter following the screening, "HOLY HELL!! #BohemianRhapsody is ABSOLUTELY FANTASTIC!! A rousing emotional cinematic champion that will rock you! #RamiMalek is magnificent! It's great FUN & it will ROCK YOU!! #AStarIsBorn, you've been served!!" In the eyes of many a critic, Malek went above and beyond in his interpretation of Mercury. From his voice (he took on a west London accent to emulate Mercury's own lilt and reportedly used some of his own singing voice to blend with Mercury's for the musical performances) to his physicality (the mullet in Mercury's younger years, the mustache in his older days, and the strut that oozes star power), the actor apparently comes across wonderfully on screen. "Rami is fantastic, and very passionate about telling Freddie's story," The Hollywood Reporter's Rebecca Ford said post-screening. Though Bohemian Rhapsody as a whole may not be the most spectacular thing moviegoers will see this year, Malek's performance as Mercury sounds like it will be. Given how troubled the film's production was, what with director Bryan Singer getting fired and replaced by Dexter Fletcher following reports of unprofessional behavior and all, it's lovely to hear that the finished product shines. Playing a real-life figure is never an easy task for actors — no matter how much they look like the people they portray. For Malek, stepping into Mercury's shoes for Bohemian Rhapsody meant more than just putting on an accent, rocking eccentric costumes, and wearing false teeth that gave him the overbite for which Mercury is known. Malek practiced singing Queen songs every night while wearing the fake chompers before Fox even greenlit Bohemian Rhapsody, and pored over Mercury's past interviews and performances "just to understand the [different] sides of him" (via Entertainment Weekly). The actor even took a trip to London — financed entirely out of pocket prior to when Bohemian Rhapsody received funding — to conduct research. Malek met with Queen drummer Roger Taylor and lead guitarist Brian May, dug into biographies, and watched old footage of Mercury. Additionally, Malek worked with movement coach Polly Bennett to capture Mercury's unique physicality, and collaborated with choreographers ahead of filming to ensure he was as prepared as he could be. Speaking to Vanity Fair, Malek shared that Bennett would have him "do ludicrous things like ski across the room," in efforts to mimic Mercury's signature on-stage theatrics. "Sometimes, we would sit in the dance studio and just watch Cabaret over and over again. Or Bob Fosse's [choreography] in Sweet Charity, and you see the elegance that he has and the poise that he has coming from them," Malek said, adding, "I sat down with choreographers before we started, [because I knew] I would need to be as spontaneous as [Mercury] was in every moment — onstage [and] in his personal life." Malek essentially studied every little Mercury did — from the "way his lips moved while he was singing" to what was "happening in his throat and his vocal cords." Sounds like all that hard work paid off. Once Fox lifts the review embargo a few days ahead of the film's release, opinions about Bohemian Rhapsody are sure to change. For now, though, the initial responses are promising. Decide whether Bohemian Rhapsody is a killer queen or a just a bunch of radio ga ga when the movie debuts on November 2.